The voice is the purest form of expression. Giving yourself permission to learn how to sing is a powerful gift. I work with a range of clients and organisations to find their voice. This can include improving technique, audition preparation, recordings and performances. I also work with those new to voice work or those who have experienced trauma. Using medative techniques we can work together to unlock your voice and help free an inner sense of identity. Team building through music can be a fun way to create memories for staff and enhance wellbeing in the workplace. Become a choir for an afternoon or write new lyrics about your company to a well known song. Encourage the poets and songsmiths to express themselves! I also design content for courses and programmes across a wide range of pathologies. Feel free to give me a call to discuss your musical needs. Songwriting is an intensely creative process giving rise to expression and emotional freedom through melody and words. Songs are inside us - all around us. I offer 2-4 hr workshops to groups and individuals. I work with producers,industry professionals and songwriters from The Songwriting Academy. I am open to collaborations as a top line & track writer or session player & vocalist. 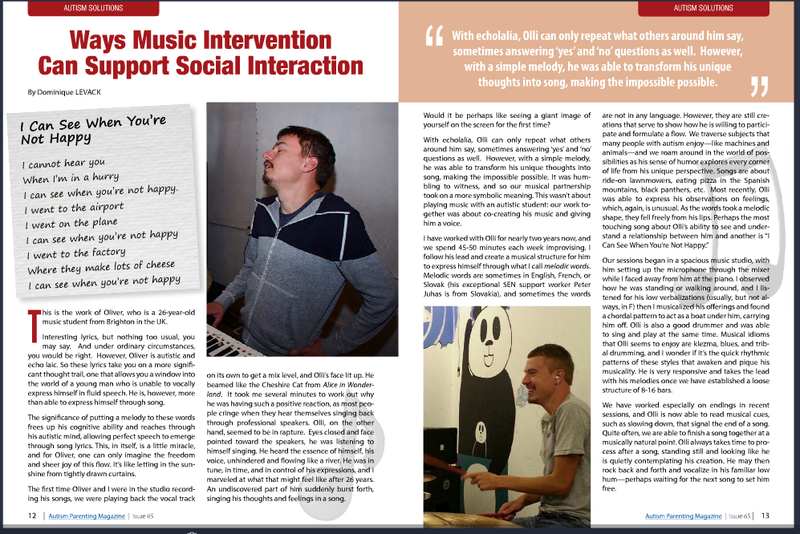 Music can be the key to unlock potential and expression, especially in those with learning difficulties including autism. I welcome enquiries from schools and day centres who want to explore this avenue for their clients. I have experience in working with non verbal students using songwriting and improvisation. Please see below for my articles published on this subject. I’m passionate about sharing the extraordinary power of music. Presentations of work can be meaningful shared experiences for both performer and audience. Please contact me to speak or present work about the value of music in healthcare at your conference. Linkedin article published by BAMT Leading Note 2016.